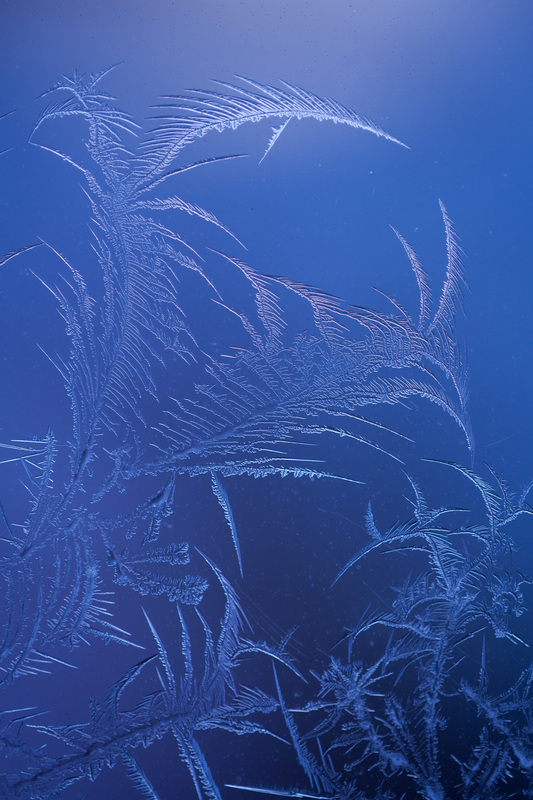 Still related to the past days freezing temperatures, we could see frosting forming in our windows. I decided then to get really close to see the shapes and patterns created by the frosting and I took a couple of pictures with the 2 macro lenses I have: the Canon EF 100mm f/2.8L Macro IS USM lens and the Canon MP-E 65mm 1-5x macro Photo lens. I started with the 100mm lens which allows me to get 1x magnification and has a very short focusing distance compared to non-macro lenses. The 2 first images on this post (above) were taken with it. We can see how the frost looks like to start in one place and then, like a river, it flows and form other branches. Very cool. But even though the Canon EF 100mm f/2.8L is a macro lens, it does not compare to the magnification power (up to 5x) of the MP-E 65mm lens. The latter 2 images here were taken with it. And now we can get closer to one of those branches and inspect it better. It is a whole other level of detail! But working with the MP-E 65mm lens is a lot more work because it does not have image stabilization like the EF 100mm f/2.8L Macro lens and, at higher magnifications, depth-of-field becomes more and more thin, so using a tripod is fundamental. I actually use also a Kirk FR-1 Macro Focusing Rail which makes this job much easier by allowing me to do tiny adjustments to focus by moving the camera back and forth in really tiny increments. The other disadvantage of this lens is that if if you see an alien spaceship flying above, you will not be able to take a picture of it with this lens, as it really only focuses on very close subjects. The EF 100mm f/2.8L Macro lens works normally as a "regular" lens and can focus on infinity. It is nice once in a while to take a break from taking family pictures and explore the small (and sometimes really small) world around us.